Caramelized Butternut Squash is not only healthy but it’s so easy to make and it only requires 5 ingredients. I love all kinds of squash from Acorn to Zucchini to Yellow squash. I was raised on it. My Mom made the most wonderful Yellow Squash with a touch of onion and butter and it literally melted in you mouth. I’ll have to get her recipe for you because I know you’ll love it. And then my Aunt made great Zucchini bread that tasted like the best cake I’ve ever had. Super moist, rich and full of spices. I think we all bring something with us from our childhood when we cook. My Aunt’s inspirational bread was the basis for my Healthy Pumpkin Muffins – another great squash recipe. But with all the varieties of squash I’ve used in recipes, I’ve never used Butternut Squash. Until recently. It always just looked intimidating and I kept hearing horror stories about how hard it was to cut. So when I was at the market, I would just stroll right by it. What changed my mind was Ina Garten. I recently saw a recipe of hers where she cut the squash in small pieces and roasted it with brown sugar and butter. I’m a sucker for almost anything Caramelized and roasting is my favorite way to do vegetables, so I knew I had to try it. 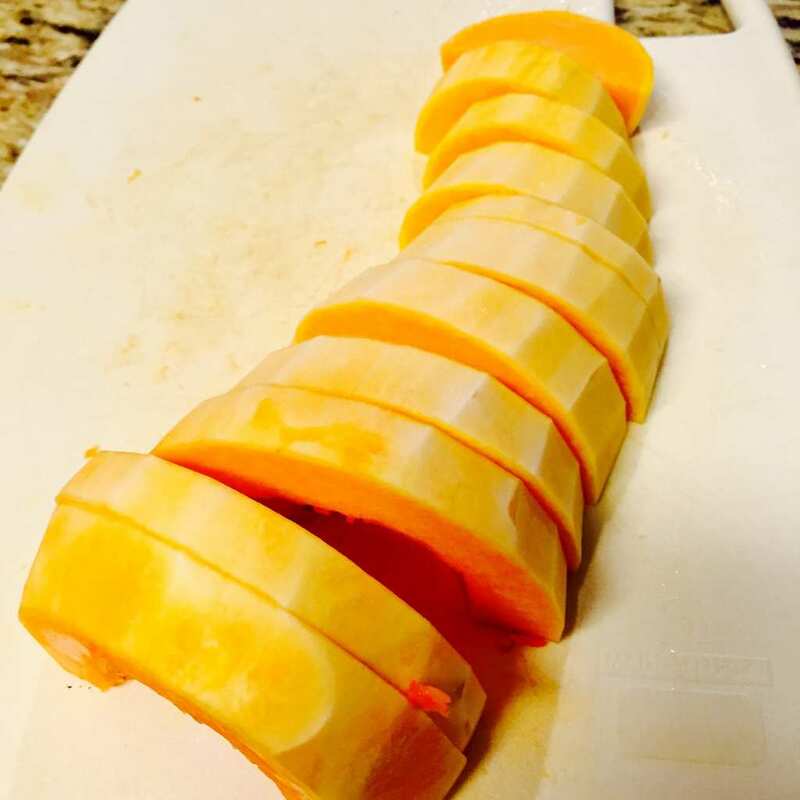 After preheating your oven to 400 degrees F, it’s time to tackle the job of cutting up the butternut squash. You know how things build up in your mind sometimes and you’ve convinced yourself that something’s difficult? Well, this is one of those times. I got out my cutting board and my largest knife and I felt like I was Julia Child boning a chicken for the first time. But when I cut into to that gorgeous squash, reality proved totally different. 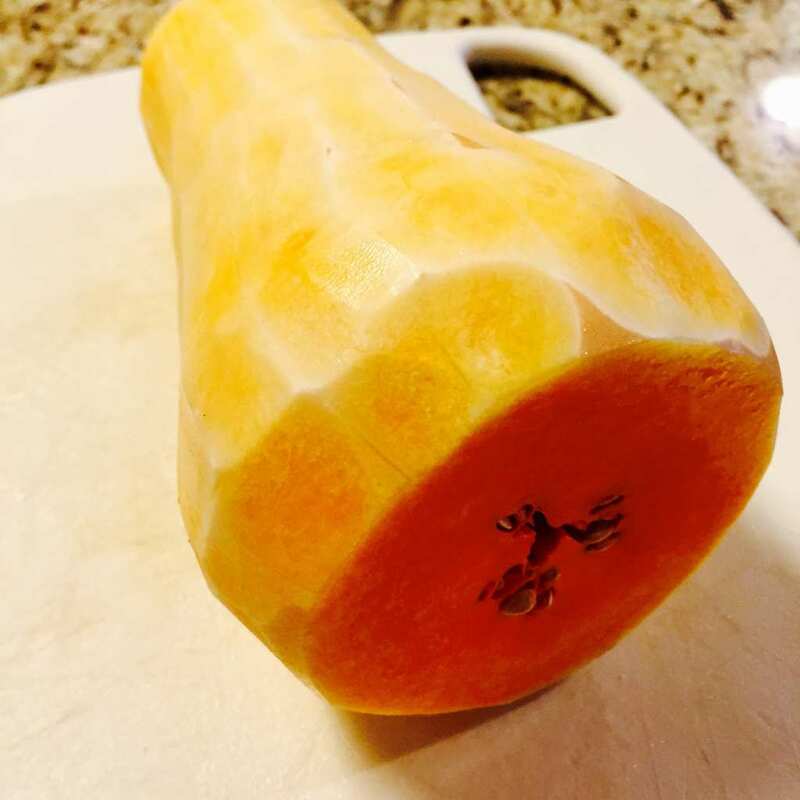 Butternut squash is a piece of cake to cut. So much easier that Acorn squash. Next, I trimmed off both ends, peeled it and then cut it in half lengthwise. So far so good. Slicing it into 1” strips and cubing it into pieces 1” x 1” was absolutely no problem. 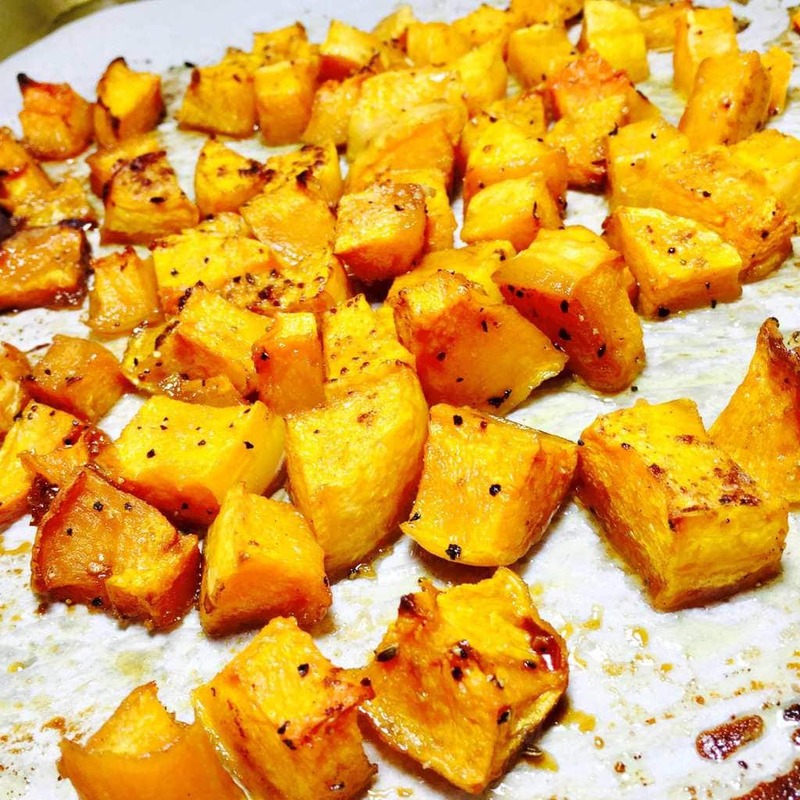 Then I added those butternut squash cubes to a sheet pan. 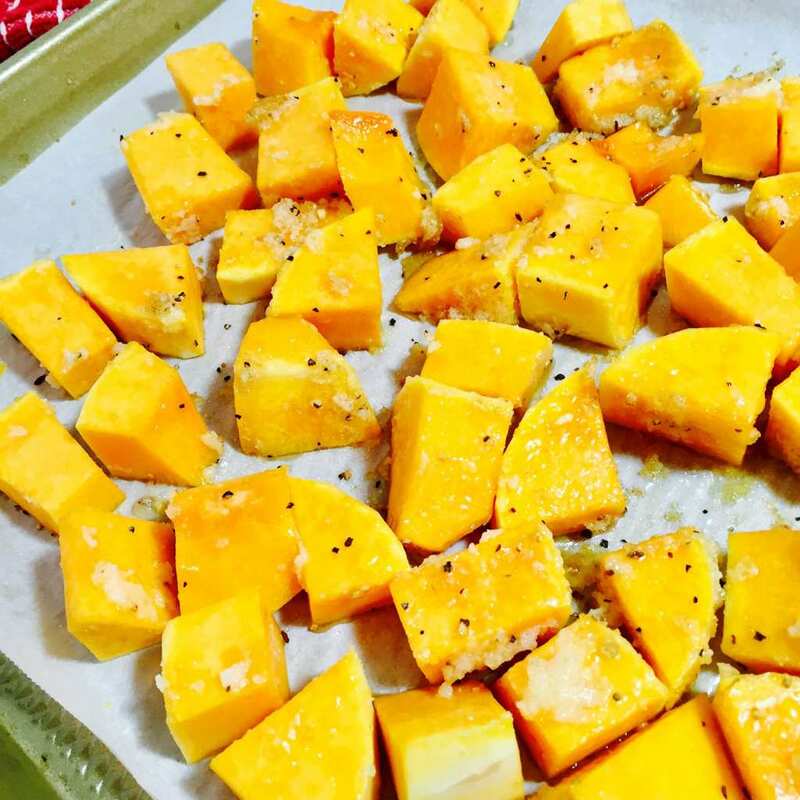 A large sheet pan is really necessary for this recipe because you want the squash to roast without crowding, so it can brown evenly. 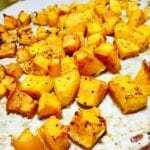 Next, I melted the butter and poured it over the top of the squash and then sprinkled brown sugar, a touch of pepper and salt over all. Then mixed it altogether and spread it out to a single layer on the pan. When you think of caramelizing you think of adding salt to counterbalance the sweetness of the brown sugar. That simple combination results in fabulous desserts like Salted Caramel Macaroons or Salted Caramel ice cream. And it’s what gives this butternut squash recipe such great flavor. Next, I roasted the cubes for 30 minutes. Then gave them a good stir so they would brown evenly and let them continue to roast for another 25 minutes. At this point they were tender and golden brown and ready to serve. We really loved this recipe and hope you do too. Thanks Ina. Another home run! If you liked this recipe, please leave a comment below and be sure and pin this recipe on Pinterest! 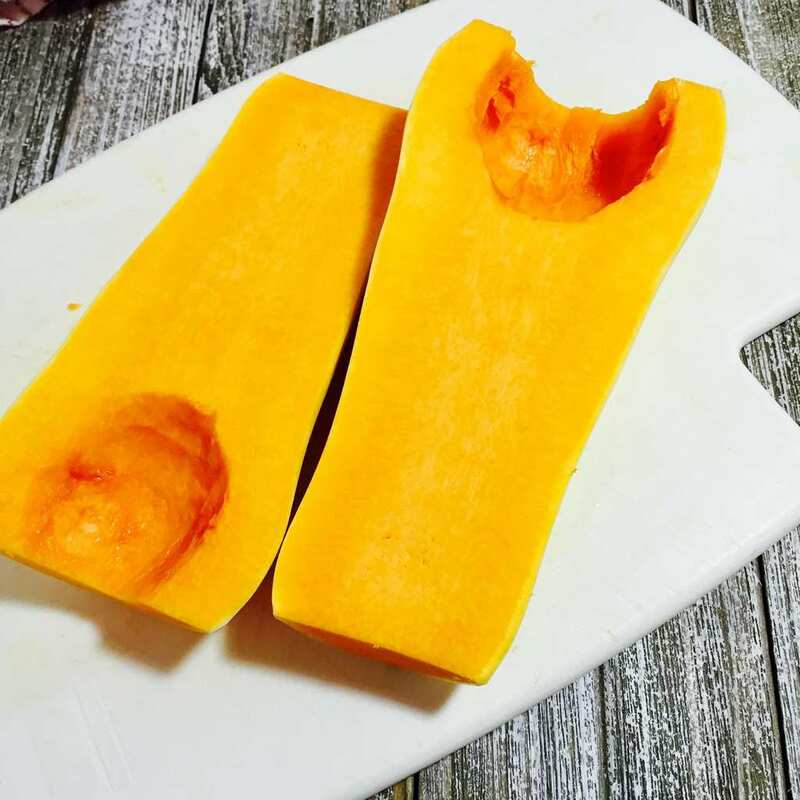 This Caramelized Butternut Squash is not only healthy but it’s so easy to meake and it only requires 5 ingredients. Trim ends and peel butternut squash. Slice in half lengthwise and scoop out the seeds. Cut each half into 1" cubes. Add cubes to a sheet pan. Pour melted butter over the squash. Sprinkle with salt, pepper and brown sugar. Mix to coat the squash and spread to a single layer on the pan. Roast for 30 minutes. Stir the mixture to be sure squash browns evenly. Then continue to roast another 25 minutes.